The highest concentration of pigments guarantees luminosity and depth of all colours. HORADAM® GOUACHE can be used directly from the tube or thinned with water and can be mixed and combined with all other series of Schmincke gouache. The colours dry to a matt surface and therefore take on a slightly lighter colour. Available in 15 ml tubes, Titanium white also in 60 ml. The application possibilities of HORADAM® GOUACHE are extremely versatile. Although it can be heavily diluted, gouache is mainly intended to provide opaque application of colour. Opaque, in this case, means that it is not impasto, because impasto application tends to produce cracking, unless the percentage of binder is increased by adding gum arabic (50302). While watercolour painting work goes from light to dark (the white paper is the light), in gouache painting, any process can be used. 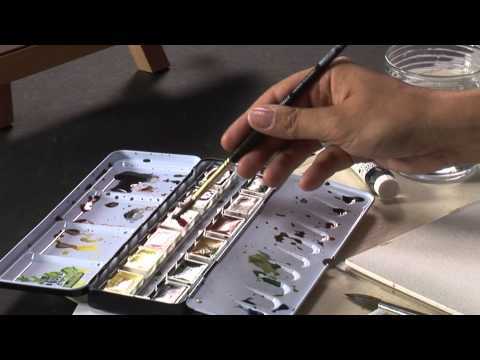 While “back painting” of lights is limited in watercolour painting, when working in gouache (and other opaque colours), light values and lights can be added later using colours. Students understand very quickly that gouache colours dry more brightly and therefore find the appropriate dosage when mixing.